Who's behind the Boujdour block? Two companies - linked to each other - both claim to have ownership over the Boujdour Offshore Shallow block in occupied Western Sahara. Things are unclear when it comes to the Boujdour Offshore Shallow block in Western Sahara. Two small companies both claim to possess rights over the block. The first is called Teredo, a company WSRW has covered in the past. According to the magazine Conjoncture, Teredo holds 75% while ONHYM holds the remaining 25% of the controversial block. Conjoncture wrote that the agreement was signed in December 2010, that it ran for a period of two years, and that it covered acquisition and processing of seismic data. WSRW first wrote about Teredo involvement in 2011, when the block was first signed. According to the Moroccan official gazette of 16 June 2011, the agreement with Teredo was inked already on 21 February 2011 - a few months later than the date reported by Conconcture. The agreement was signed by the firm “Teredo Morocco Limited” , part of the group “Teredo 1”, according to the gazette. The latest map from ONHYM, as of 03 July 2013, shows that the licence today is held by "ONHYM-TEREDO" and that the size of the block is 7244,4 sq.km. That means the size of the blocks has been reduced from its original size of 9056 sq.km. According to the news service Africa Intelligence, 21.Feb 2013, the company has employed Mouhsine Ali M’Barek as its local representative. M'Barek is, according to Africa Intelligence, a former director of the oil assets department of ONAREP that merged with BRPM in 2003 to form ONHYM. "And he’s by no means a novice. He already represented the U.S. firm Vanco that drew a blank when exploring in Morocco", wrote Africa Intelligence. WSRW research reveals that Teredo is in fact the UK registered Teredo Oils Limited. Teredo Oils was originally registered under the name Warfolk Ltd. By the end of the 90s, the company name had changed to Teredo Oils Ltd, and in 2000 the company described itself as engaged in "Extraction of petroleum & natural gas". In 2005-2006, it was engaged in a exploration and production of oil and gas in Spain, and the ownership of Teredo was transfered from a former parent company in Madeira to Ascent Production Ltd. The latter is a subsidiary of Ascent Resources. Ascent, in turn states to have purchased 100% of Teredo Oils Limited in November 2005. Ascent clarifies that Teredo had at the time the Ayoluengo Oilfield onshore, Basque Country. In 2009, Ascent sold off its its shares in Teredo, and a new secretary/director came into the Teredo Oils, Mr. Alan Soulsby, with background from a series of smaller similar companies. Soulsby co-directed the company with a 92 year old Florida based businessman that had been associated with Teredo for several years. From 2012, things have become a bit more unclear as to the ownership of the Boujdour block in Western Sahara: This is when the second company enters the equation - Imara Energy. Mr. Alan Soulsby is also board member and technical director of Imara, a small Canadian registered company. 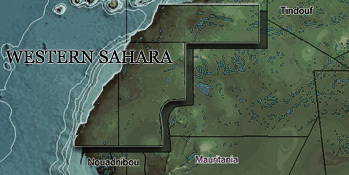 Imara does not enlist any activity in Morocco or Western Sahara on its webpages. 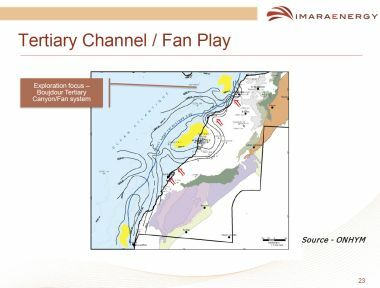 But in a company presentation dated 13 Nov 2012, Imara claims to hold 100% ownership and a "Production Offshore Agreement (PSA)" over the Boujdour Offshore Shallow block. See the report's page 3 here. Phase III – performance guarantee, 3D seismic, Well to test JU or KI. WSRW has not yet been in contact with Teredo or Imara.